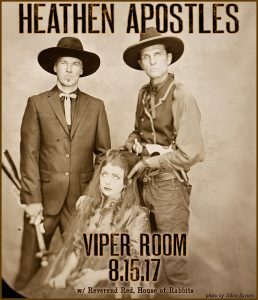 The Heathen Apostles will be performing on Tuesday, August 15th at the Viper Room. Joining the band as a special guest will be Benedikt Brydern on violin (a good friend and band leader of Hot Club Quintette, for which Mather sings.) The evening’s bill will also include Heathen friend Reverend Red as well as the House of Rabbits- get your tickets in advance HERE. This entry was posted on August 8, 2017. It was filed under Uncategorized.